The MOST Complete & Effective Spiritual Healing & Holistic Hypnosis Courses plus Psychic Training For Professional Practitioners in Australia & Asia. Auset Temple Healing is designed as both a University for your Soul and to provide you with a method of discovering your Soul purpose ...and how to live it with great joy PLUS as a system of self healing the physical body and emotions. Incorporating the exceptionally effective Auset Temple Healing system - previously called Isis Lotus Healing. - see below for course levels and then individual course descriptions. All these courses are a very effective and highly researched system of healing for your self and others. The advanced levels are for the serious spiritual seeker and professional healer but Auset Temple Healing Level One by itself is a powerful system of healing for yourself and others that most people can master quickly. They are also self empowerment courses - designed to show you how to sort out many difficult life situations for yourself by spiritual, clairvoyant or mindfulness methods. Taken together, Angel Miracles, Hypnosis and Regression Courses and Auset Temple Healing Courses are a complete system of professional training for healers, spiritually focused hypnotherapists and psychics seeking a truly wonderful personal life plus to be of great service to many clients. Elisabeth’s students have gone on to perform professional palm readings, tarot/card readings and hypnosis. Most Angel Miracles and Auset courses are 2 days duration and ALL MUST be attended in person due to the incredible personal healing, clearing & energy attunements/Initiations given to each student. We regret are not therefore able to offer correspondence or online courses. PLUS Isis Lotus Healing is now called Auset Temple Healing. The first level Auset Temple Healing Courses remain the same and previous Isis Lotus Healing courses attended are still accepted as prerequisites in most cases - please email our office if you require clarification. FOR DATES, LOCATIONS & FEES PLUS TO BOOK FOR COURSES taught by ELISABETH JENSEN please see here NB! All Singapore Bookings are direct through The Blue Lotus www.thebluelotus.sg - only Adelaide Courses can be booked on this website. These incredibly effective & beautiful courses have been taught by Elisabeth Jensen since 2001. Prior to this she taught Ascension Healing and Angel Blessings and many other methods of healing. Course content has been updated in 2015 and 2016 based on the channelled Teachings of Archangel Hamied and to make them more suited for all levels of practitioners. These courses have become so successful Elisabeth has now taught them Australia wide, in USA and continuously in many parts of Asia - there is much demand for these life changing courses. Incorporating the Teachings of Hamied, Angel of Miracles they are unique in content and MANY miracles do occur for students - sometimes during courses but usually in the days and weeks afterwards. You will be taught to quickly communicate with Angels and 90% of people can see angels and auras at the first level of the course! A large part of the success of these courses are the incredible individual angel energy attunements Elisabeth gives each day to participants to connect them with angels and open the third eye. 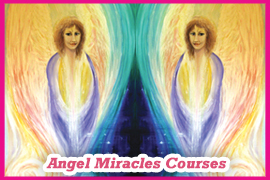 - see each individual Angel Miracles Course Level for detailed information. Authorised Angel Miracles Teachers also teach Levels One & Two plus some also teach Angel Miracles Psychic Mediumship. ANGEL MIRACLES PSYCHIC MEDIUMSHIP - requires Angel Miracles Levels 1 ONLY. IN THIS BEAUTIFUL AND EXCITING TWO DAY COURSE you will learn to see, touch, talk, CREATE MIRACLES and heal with the angels. Let the angels heal your life! This course is guaranteed to change your life and your perception of the world as you know it and give you inner peace and ability to cope with your challenges in life. Do it for yourself! A wonderful course for those new to this area OR for advanced practitioners...and is guaranteed to greatly enhance your psychic abilities. Incorporates the channeled teachings of Hamied, Archangel of Miracles. Experience powerful meditations personally channeled by Elisabeth to connect you with your Guardian angels and Archangels and to receive messages from them. Includes a Beautiful Energy Attunement to Hamied, Angel of Miracles - plus the powerful TEACHINGS OF HAMIED. Other methods of receiving messages are also taught e.g. automatic writing or dictation, oracle cards and during meditation. - How to do Angel psychic readings for yourself and friends by reading their aura and communicating directly with angels and spirits. - How to see and be touched by angels. Everybody in this course can feel or sense angels or touch them and many see them. - How to draw angel visions, experiences and miracles to you and use clairvoyance to communicate with deceased loved ones. - Special methods and practices to enhance your ability to see angels and auras. - How angels can heal you and your loved ones and how to request a Miracle Healing for yourself and others. Includes two beautiful energy attunements to connect you with the angelic realms quickly and easily plus to activate your third eye vision and spiritual hearing and Archangel Raphael's powerful healing energy. This Level and Level Two are also taught by Authorised Angel Miracles Teachers. Level Two trains you to give Psychic Angel Card Readings. NB! Elisabeth no longer teaches this level but Authorised Teachers still do. It is no longer a requirement for the Angel Miracles Psychic Mediumship Level. This course will focus on developing your skills to receive messages from angels and to use them to give accurate tarot readings for yourself, family, friends and clients. You will need to purchase a set of 'Messages from your Angels' by Doreen Virtue PHD (or other Angel Cards if preferred by your teacher) and we will use these amazing cards as the basis off the psychic tarot readings we do. You will be taught to use them in mainly intuitive way and as a focus for your clairvoyance. Please remember to bring them to the course! - Highly effective spreads not in the guide book will be demonstrated as well as detailed additional information about the cards. - Elisabeth's methods of teaching are UNIQUE to her and very effective! - Includes methods to further develop your third eye vision so you can read your clients aura and energy, plus further insights on medical intuition and aura colours. - Two very powerful and beautiful energy attunements including to the Archangels Metatron & Gabrielle to reconnect you energetically to your psychic self & to assist you with card readings. - Meet your spirit guide to assist you in contacting deceased loved ones for mediumship readings. - Learn to give messages DIRECT from the Angels and Spirit World for yourself and clients! - Spiritual Counselling skills to enable you to always give an uplifting and positive reading. - Skills in identifying the source of messages Angels or Departed Loved Ones. - Find answers to personal concerns in this highly experiential and interactive course. - Please bring extra sets of Doreen Virtue Oracle Cards if you have them as you will be shown how to do detailed readings using multiple card decks. Intensive Course ingiving detailed Evidential Mediumship Readings for clients. Includes Counselling skills so you can always give positive and healing psychic readings to clients. Elisabeth is a highly trained & gifted Psychic Trance Medium who also worked as an Intensive & Palliative Care Nurse for many years so brings an extra depth to her compassionate approach to teaching Mediumship Readings. The Focus of this course is on giving Mediumship Counselling Readings plus Spirit Releasement if required. Pet Mediumship is also included - Elisabeth has demonstrated Cat Mediumship in particular worldwide. Also includes Spirit Releasement Therapy - advanced methods to release lost souls and clear negative energies and attachments for clients. ::Includes beautiful Archangel Energy attunements, workbook and Certifies you as an ANGEL MIRACLES PSYCHIC MEDIUM. PRE-REQUISITE COURSES: Angel Miracles Levels 1 and Psychic Mediumship plus Auset Temple Healing Level 1 and Auset Temple Divination. Scroll down for more information. Secret Ancient Egyptian Healing Codes for Modern Day Miracles. Based on a very ancient & powerful Healing & Alchemy system used 49,000 years ago in Egypt & channelled to Elisabeth Jensen by The Goddess Auset plus the God Tehuti aka Thoth. Courses need to be taken in order below. Keep Scrolling down for full course descriptions please. Authorised Auset Temple Healing Teachers also teach Auset Temple Healing Level One & Advanced Auset Temple Healing Teachers also teach Auset Temple Divination & Auset Temple Healing Level Two. Full Course details are below. Releasing the Secret Healing Power of the Great Pyramid of Egypt & the Divine Blue Healing Energy of Goddess Auset to YOU! DISCOVER FOR YOURSELF THE POWER of these Secret Egyptian Healing Codes and why so many healers, nurses, doctors, lawyers and parents around the world are seeking to study this beautiful and remarkably effective system of Alchemical Ancient Egyptian Healing. This is the first course taught in Auset Temple Healing which is like a University for your Soul and is also a spiritual school for a new generation of highly skilled and trained professional healers and psychics. Auset Healing is a system of Spiritual Energy Healing based on Ancient Egyptian Healing methods and Alchemy. It includes working with energies from the planet Sirius plus the Egyptian Divinities, especially Goddess Auset. Auset is also known as Isis is the Ancient Egyptian Mother Goddess of Magic, Healing and Spiritual Science and attunement/initiation of the student to her powerful blue healing energies are the basis for this highly effective healing modality which is taught over two full days. ELISABETH JENSEN, the founder of Isis Mystery School and Auset Temple Healing plus the Angel Miracles Courses, has incorporated much of her past research and practice of Energy Medicine and Healing into these courses to ensure it’s a safe and reliable healing system for all. Elisabeth is the author of the best selling Auset Egyptian Oracle Cards and comes from a background as an Australian Registered Nurse and has studied and taught a number of researched based energy healing modalities and is great demand worldwide for her healing abilities. Research has documented profound and seemingly miraculous healings experienced by her clients plus course participants. Elisabeth is also a psychic medium and channelled much lost information from Auset and the Divinities plus has led ten Sacred Journeys to Egypt. AUSET TEMPLE HEALING IS WONDERFUL FOR SELF HEALING plus for family and friends or as a "Hands On" system of healing for clients. The Auset Divine Blue energy is sent from the hands and heart with love and a great healing effect. The Divine Feminine Indigo Blue Energy of Auset used for this healing system derived from a powerful mystical healing experience Elisabeth had while meditating in the Queens Chamber of The Great Pyramid of Egypt in 2003. The healing energies and teachings have increased each year during her many Auset Sacred Journeys to give Initiations and channelling in the temples and pyramids of Egypt. This is a beautiful and highly effective system of healing for those with chronic and acute pain, stress, migraines, neck and back problems, chronic fatigue and many other ailments. Both Elisabeth and Auset Temple Healing students and teachers have experienced remarkable results using this system of healing both for themselves and clients. Course students have also received amazing healings following attendance through the “Self- Healing” techniques taught during the course. Auset Temple Healing is very different system of healing to say Reiki, Sekhem, or Isis Seichim. INCLUDES 3 BEAUTIFUL ENERGY ATTUNEMENTS/INITIATIONS to the Auset Divine Blue Healing energies plus Universal Energy and the Goddesses Auset and Nuit. Activates wonderful healing and psychic abilities latent within us all when your 12 strand DNA & Cosmic Energy Field are activated by this energy. Spiritual Surgery Techniques are also taught - a simple and safe process, wonderful for when nothing else seems to work! PLUS Isis Lotus Healing is a planetary system of healing and can heal the environment where it is practised. This very popular course swept the world in its first year of teaching in 2004. Elisabeth taught it Australia wide, in Singapore and USA and continues to teach internationally. Elisabeth also trains many professional practitioners, plus Authorised Auset Temple Healing teachers, in this remarkable system of healing to cope with demand for these teachings. PREPARATION FOR COURSES plus WHO SHOULD ATTEND? THERE ARE NO ESSENTIAL PREREQUISITES OR PREPARATIONS. Please bring a small natural clear quartz crystal to hold during the attunements if you wish. A vegetarian diet is always recommended for Auset Temple Healing courses, but is not essential. READING related Articles at www.isismysteryschool.com/articles first would assist the new student or those wanting more information. Reading Elisabeth's Auset Egyptian Oracle, Ancient Egyptian Divination and Alchemy Cards is also helpful. A reasonable level of physical and emotional health is recommended. Not recommended for pregnant women due to the intense energies, although no adverse effects have ever been documented or expressed. NB! Angel Miracles Level 1 is more suited to those with health concerns wishing to self heal or for pregnant women. ALL HEALERS, even those with advanced skills, find this workshop greatly enhances their healing abilities but even newcomers become effective healers! All Health Care Professionals can adapt these energies and the knowledge taught to greatly enhance their practice of nursing, medicine or massage. Click to view the Auset Temple Healing Cards in our store. Train as a Psychic Oracle of Auset, the Ancient Egyptian Goddess of Prophecy. Using the best selling and beautiful AUSET EGYPTIAN ORACLE, Ancient Egyptian Divination & Alchemy Cards by Elisabeth Jensen. These cards replaced Elisabeth’s previous Isis Lotus Oracle, Ancient Egyptian Divination and Magick Cards. These 44 Oracle Cards will enable you to be able to give yourself & others clear, accurate, wise, specific & insightful psychic readings. Prerequisite Course: Auset Temple Healing Level One. The Auset Divination course is an essential prerequisite to Auset Healing Level Two. Auset Egyptian Oracle Cards are best purchased in advance to prepare for this course - please read the guidebook prior to the course - and bring your Auset Egyptian Oracle Cards with you please ! Using the process of Divination - i.e. to commune with the Divinities to access their wisdom and guidance & Alchemy - transforming dense physical energies to higher ones through Initiations/Energy Attunements & Meditations - we will transform our lives then be able to give positive, accurate & healing psychic readings for family and clients. See your own life, understand why situations are occurring & change your future if you wish using Ancient Egyptian Alchemical ways to do this. Elisabeth has much experience in giving psychic readings plus has researched this subject in GREAT detail & these practices & meditations are highly effective. As a Triple Award Winning Psychic with 23 years experience giving various forms of psychic Readings & Healings worldwide these cards reflect her expertise in this area. A wonderful way to connect with many of the Ancient Egyptian Divinities & receive their messages plus to enhance your Auset Level One Healing practice. You will be able to offer such wonderfully helpful & surprisingly specific & wise psychic, palm, tarot or any other type of reading to yourself and family and clients. Includes invoking each Divinity, Egyptian Alchemy, Numerology, Past Life Readings plus how to use the cards for medical intuition if combining Readings & Auset Healings. Includes a highly effective Karmic Release Meditation & Clearing by Elisabeth for all students. PLUS powerful Energy Attunements/ Initiations to the Egyptian Gods Horus & Amun Ra - to clear & activate your third eye. Plus to Goddess Auset to Initiate you as an Oracle of Auset. Includes two energy attunements, comprehensive notes, plus a Certificate as an Psychic Oracle of Auset. Essential Prerequisites: Auset Healing Level One & Auset Temple Divination. This Auset Healing Level 2 Course continues to be a Hands on system of Healing that works at Soul & Akashic Record Level . As past life Karma & much present day Karma is cleared healing often can occur spontaneously. Includes attunements to the Goddesses Sekhmet & Maat, Auset Soul Energy Clearing & highly effective detailed Karmic Release Process. Plus Divine Seed Pearl activation for true Karmic Healing & Ascension. Heals at a very deep & permanent level. Also includes guided meditations to use with your clients. Divine Seed Pearls are within us all - they are like our Soul Energy Blueprint. They need to be cleared and activated so we can manifest healing all levels for our clients and ourselves. Healing at this level can be for major and minor physical disorders plus difficult situations and people in our life! Plus we can do this for family & clients. The Goddess Sekhmet energy is so transformational and intense - all the very powerful and skilled Ancient Egyptian Healing Priests and Priestesses were Priest/esses of The Goddess Sekhmet. We also work with White Lotus Energy & Sacred Geometry plus many more Ancient Egyptian Divinities whom we realise offer us much Divine Healing Power when we know exactly HOW to work with them. 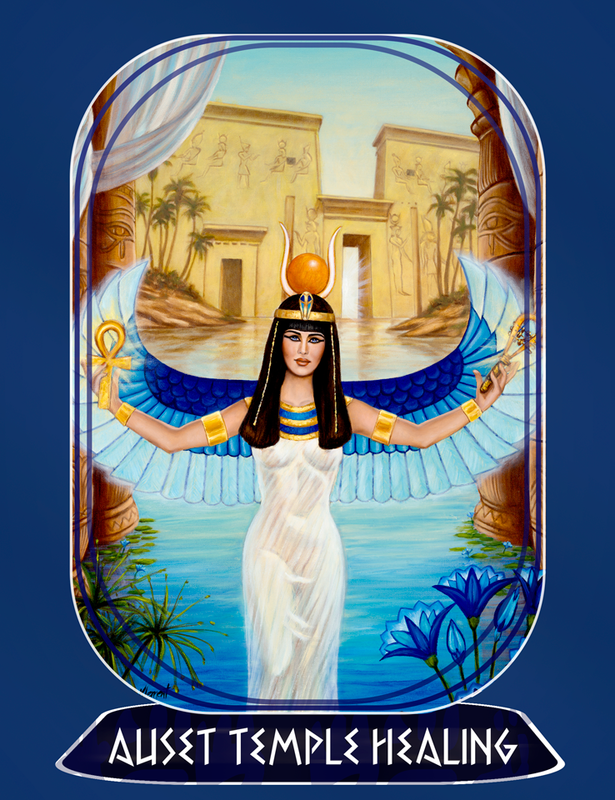 SACRED ALCHEMY of the Goddess Sekhmet plus ancient Egyptian priests and priestesses for Sekhem ( Kundalini) activation – greatly enhances your psychic and healing powers!(NB! please see information below). You will receive much secret encodements and knowledge – including White Tablets Blessings plus Siriun Star Reconnection. This is a divine two days of advanced meditations – just for yourself! As you activate your KA body ( Etheric Body) to an advanced degree it merges with your BA ( Soul ) to ensure the SAHU process occurs – that is you take on your Eternal Body of Light necessary for true ascension or enlightenment. *NB! This course is not suitable for pregnant women or for people with neurological or emotional disorders. Please contact Elisabeth Jensen prior to booking to discuss if you have concerns re attending. Prerequisites: Angels Miracles Level 1 plus Psychic Mediumship, Auset Temple Healing Level 1 plus Auset Temple Divination. Learn to verbally Trance Channel the Archangels Hamied & Michael,plus the Ancient Egyptian Divinities. This is a Professional Level Course that will enable you to give amazing Channeled Client Psychic Readings by phone or in person. We also train you to give remarkable Group Public Channeling Events plus Elisabeth will ensure you also have the confidence to do this. Students are advised to attend any of Elisabeth's Channeling Events to prepare for this course please. Please bring your Auset Egyptian Oracle Cards plus a NATURAL clear quartz crystal ball to this course - medium size is best. Prerequisites: Auset Temple Healing Level 2 plus Secret Codes Sekhmet & Auset plus Angel Miracles Psychic Mediumship. Auset Temple Trance Channeling is recommended but not essential. COMPLETION OF THIS COURSE WILL GIVE YOU THE QUALIFICATION OF AUSET TEMPLE HEALING INITIATE. COMPLETING ANGEL MIRACLES LEVEL 3 PLUS additional practical work will give you the qualification of PROFESSIONAL AUSET TEMPLE HEALING CERTIFIED PRACTITIONER. A miraculous system of Soul and Physical healing given to Elisabeth in the Kings Chamber of the Great Pyramid in 2005. A system of healing previously only known to the Ancient Egyptians Initiated in the Great Pyramid Alchemical Soul Healing reconnects the Soul to the physical body allowing for deep healing on many levels. Further details of this course will be given to you in Auset Healing Level Two. After completing Angel Miracles Levels Psychic Mediumship plus Auset Temple Healing Level 3 plus a number of documented cases, consultations and case studies this certification will be granted.